THE BOX is about to enter my life. I think. Maybe. Probably. Well, maybe. 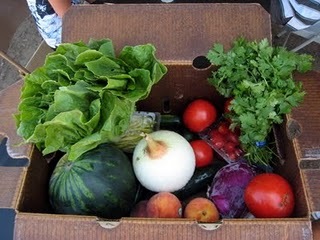 The box I refer to is a weekly or bi-weekly box of organic fruits and vegetables hot off the farm. Lots of people I knew in Berkeley got a box of this sort, filled with local in-season produce from any one of a number of small farms in the region. I was very surprised to learn that you could get such a box in the depths of L.A. Tanaka Farms, just down the road in Orange County, supplies lots of families with their organic fruits and veggies. And just recently, two families in my own circle independently mentioned that they themselves receive THE BOX. And this has me worried. Because it means the universe has a plan. Marya gets THE BOX, and feeds her family of four with it. It's really cut down on our produce bill, she told me. "And it forces us to eat healthier, although sometimes I admit I don't know what they send us." She pulled out a large…well it looked like a green heart, as in the organ, with alarming valve-like stalks shooting out of it. "Name this vegetable," she said. I guessed celery root and was wrong. She didn't know either, "but I'll just chop it up and put it in a soup." And Marya is just the kind of organized, disciplined power woman who will plan out her weekly menu and spend Sunday making delicious soups and sauces and things to freeze for later use. I am not this kind of woman and I'm the first to admit it. Sam and his family also get THE BOX. "You won't have to buy so many cans and boxes," he told me. "This will be your food!" (Subtext: Instead of the processed, heathen crap you normally eat.) He and his family are practically vegan; non-dairy consuming, home-birthing, cloth diaper-using Berkeley-in-L.A. people. And his wife is an excellent cook. Again, I can't measure up. I don't think I have more than a handful of vegetarian recipes. What happens when my kids run screaming from all that kale? Do burritos count as heathen crap? I just don't know that I'm worthy of THE BOX. Even so, the universe keeps putting THE BOX in front of me. Just today my next door neighbor told me that she herself gets THE BOX, and I am taking the hint. I realize it could potentially change my life. The question is for the better or for the worse? So I just sent an email to Tanaka Farms requesting more information. Gulp. Stay tuned. Frankly, I'm terrified. That green heart you speak of was Kohlrabi. I too, am new to this one. It is the love child of apples and broccoli. Join the circle of the box and I will reveal its secrets to you. We got a LOT of celery root over the winter from the box Mindy arranged to pick up at the Culver City Farmer’s Market from Findley Farms. It’s excellent in minestrone soup: gives it a celery flavor but acts more like chunks of potato. Turns out it’s good if you mix it in with your mashed potatoes, too. Without the box, I never would have known. I stopped doing the box. Basically, the organic farm just kept sending us their hard-to-sell leftovers. I got more kale, beet greens, turnip greens, garlic ramps, etc. than my family could ever consume.